Dacre Stoker is the great grand-nephew of Bram Stoker and the international best-selling co-author of 2009’s Dracula the Un-Dead, the official Stoker family endorsed sequel to Dracula. He also co-edited The Lost Journal of Bram Stoker: The Dublin Years with Elizabeth Miller. J.D. Barker is the international best-selling author of numerous novels, including Forsaken and The Fourth Monkey. He is currently collaborating with James Patterson. His novels have been translated into numerous languages and optioned for both film and television. Barker resides in Pennsylvania with his wife, Dayna, and his daughter, Ember. 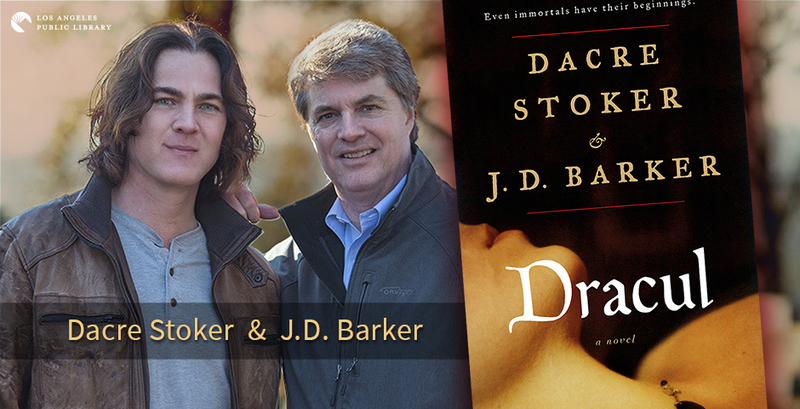 Stoker and Barker’s latest novel is Dracul, a prequel to Dracula, and both authors recently agreed to be interviewed by Daryl Maxwell about it for the LAPL Blog. What was your original inspiration for Dracul? DS: I was very interested in Bram’s undiagnosed childhood illness, and just as interested in his miraculous recovery at the age of 7 to become a champion athlete at Trinity University. Having been an athlete and coach myself, at the Olympic level, I had seen and read about athletes taking performance-enhancing drugs and wondered what if Bram had some version of “unnatural help” to assist in his recovery. Back in 1847 steroids and human growth hormone wasn’t around so I imagined what would have happened if Bram’s recovery had something to do with the supernatural that involved vampire blood. This would be a very interesting way to introduce Bram himself to the possibility that vampires were real, and if so, Bram ends up writing his famous novel Dracula as a warning to the world that they are real and are coming for us. Bram Stoker originally tried to sell Dracula as a true story. When his UK publisher proved unwilling to do so, the first 101 pages, along with the original preface, and numerous lines of text within the book, were all removed in order to fictionalize the story. At the time, Jack the Ripper was active in London and his publisher feared the repercussions of publishing a story about a “real” vampire. People were open to ideas of the supernatural, far more so than today, and something like this could have caused a mass panic. At hearing this, I immediately thought of the famous War of the Worlds broadcast here in the states. Were either of you intimidated of the idea of writing a prequel or origin story for such a well-known novel and character? DS: Yes, we were very aware that we had large shoes to fill, we needed to do a really good job to represent the Stoker family. We both felt that our story should be written in a similar epistolary style as Dracula. There are a lot of passionate Dracula fans out there, we felt we needed to deliver a story worthy of being so closely associated with the classic novel Dracula. JB: I wrestled with that for a little while. Dracula is such a classic. I’ve since heard it’s the second most read book in the world (second to the bible). It’s holy ground for us authors. Bram not only created an iconic story, but an immortal character who seems to gain popularity with each passing year. All of this was very daunting. But then there was the other two things, the ones Dacre mentioned to me…I’ve read Dracula a dozen times in my life, and it’s always started with Jonathan Harker on the train. Knowing another 101 pages preceded that, and I could be part of the team to share that information with the world was not something I could pass up. With Dracul we got to tell the story Bram wanted to share and it felt like he was right there in the room with us as we committed each word to paper. It felt right. Clearly Matilda and Thornley are based on Bram Stoker’s actual siblings. How closely were you able to pattern them to their real-life counterparts? Was it necessary to take a lot of literary license to tell the story you wanted to tell? DS: Over the past 10 years I have been collecting letters, newspaper articles, and obituaries about all of the Stoker family members. This helped us characterize each of the family members as best as we could. We did have to take some literary license but felt in the end that we portrayed both Matilda and Thornley as realistically as possible. Dacre, you’ve been researching your family for a number of years now. Did Dracul come out of that research or did you begin your research to write the novel? DS: Dracul was born out of the research, the more I did the more interesting Bram’s family became to me. I felt there was a story to be told, it just took a while to develop the initial storyline. The key was finding JD Barker who brought a lot of his own ideas to the project along with his incredible style of writing mystery and suspense. What was the most interesting or surprising thing that you learned about your family, or the novel Dracula, novel during your research? DS: How Bram capitalized on peoples real fears about Vampirism. Brams research notes contained an article from an1896 New York World Newspaper about the real Vampire scare in New England in the late 1800s. This outlined how people in the New England states hung on to old-world superstitions about the undead coming back to take blood from the living, when in fact this was just a misunderstanding of the very contagious tuberculous outbreak. Do you have a favorite Dracula pastiche, television or motion picture adaptation/interpretation? A least favorite? DS: A Favorite adaptation of Dracula: BBC TV 3 part mini-series with Louis Jourdan 1977. Least favorite: 2013 NBC Dracula TV mini-series with Jonathan Rhys Meyers. JB: The Francis Ford Coppola film is by far my favorite. He didn’t stick to the original story, but he captured the feel of that terrifying novel—a rare and difficult thing to do. I’m also a fan of the Hammer films. Do you have an idea or theory regarding why/how Dracula has become the worldwide phenomena that it is? DS: The whole concept of Dracula was born out of real superstitions that existed in many cultures around the world. Bram Stoker capitalized on real fears and concerns that hundreds of thousands of people shared all over the world. His fictional vampire touches a nerve on a concept that exists in the recesses of many peoples minds. Therefore, the afterlife and whatever might come with it, remains a popular topic to weave into horror fiction as it is almost universal. JB: It checks all the boxes: Adventure, horror, love, solid protagonist, even better antagonist, and perfect use of the epistolary style. It’s a damn-near perfect book and appeals to a wide audience as a result. Bram Stoker wasn’t the first to write about vampires, but he did stumble into perfection. Unfortunately, he didn’t live to see the success of the book. I imagine he would be thrilled to witness all that it has inspired. DS: Ken Follett, A Column of Fire. JB: Inspection by Josh Malerman and The Night Window by Dean Koontz. DS: Old Yeller by Fred Gipson. JB: Great Expectations by Charles Dickens. JB: I actually grew up without a television in the house, my parents encouraged reading from a very young age, so there was never a book I felt the need to hide from them. Dracula was the first “adult” book I ever read. I picked up a tattered paperback copy at a yard sale for $0.25 and expected someone to tell me I wasn’t old enough (I was eight) but nobody did. DS: Bram Stoker, Ken Follett, Stephen King, Tom Clancy, Pat Conroy, Frank McCourt. JB: In no particular order - Charles Dickens, Dean Koontz, Ernest Hemingway, Stephen King, Maya Angelou. DS: Can’t think of one. JB: I really don’t have one. If I don’t like a book, I don’t finish it. Life is too short to read a bad book (even if that book is just “bad” to you). I’d never force myself to read something just because all the other kids are doing it. I don’t think I want to meet the person who pretends to read a book—that sounds like a very empty way to live. DS: To Serve Them All My Days by R.F. Delderfield. JB: Not one book in particular, but shortly after I discovered Stephen King, I knew I wanted to become a writer. The first book of his I read was Needful Things. It’s funny how things come around. When I wrote my debut novel, Forsaken, King read portions of it prior to publication and let me use some of his characters from Needful Things in it. I recently bought the original typescript of that book at auction. Seeing it in such a raw form is a constant reminder to me of the power of the written word, how an author can take something from a spark of imagination and bring it to life. DS: The Last Lecture by Randy Pausch. JB: I’m always out there pushing the classics—Dickens, Twain, Hawthorne…many others. If you want to be in a rock band, you need to understand where music came from—the Beatles, Elvis… Writing is no different—you can’t take it forward if you don’t know where it began. DS: The World According to Garp by John Irving. JB: Anything by Thomas Harris. Can someone handcuff him to a typewriter, please? It’s been far too long since the last one. DS: I would love to spend a day fly-fishing with my father, who died when I was only 21. He was an avid fly fisherman, as I am now, but we never did find the time to fish together as we were both too busy with other pursuits. JB: I get up each day and get paid to write. At any given moment, I can leave my office, go downstairs, and hug my wife and little girl. I can’t imagine anything more perfect than that. DS: A work of non-fiction with my son Parker, about our search for Bram Stoker’s inspiration and research for his writing of Dracula.